The requirements for long-term resistance to cyclic mechanical loads, also known as fatigue strength, are increasing, particularly in the case of plastic components found under car hoods. Responding to this trend, Lanxess is building a new polyamide 6 product range dubbed Durethan Performance. 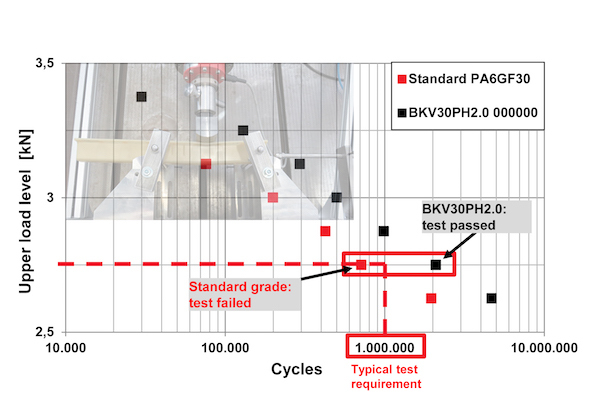 The grades are reportedly several times more resistant to fatigue under pulsating loads than standard products with the same glass fiber content. The first products in the range are the thermally-stabilized Durethan BKV30PH2.0, BKV35PH2.0, and BKV40PH2.0 compounds with glass fiber contents of 30, 35, and 40 percent, as well as the impact resistance-modified Durethan BKV130P compound, which is reinforced with 30 percent glass fiber. “With these new products, we are targeting applications in automobiles, such as air-intake systems and oil-filter modules or parking brakes. There is also great application potential for housing and structural components of power tools, such as drilling or grinding machines. And with regard to the furniture industry, for example, parts for furniture locking systems could be manufactured from the impact-resistant modified product type,” explains Dr. Thomas Linder, an expert in materials development of Durethan at LANXESS. New polyamide 6 grades offer enhanced long-term resistance to cyclic mechanical loads. In addition to the dynamic behavior, the static mechanical profile of the new construction materials has also been improved. For example, they offer more tensile strength at higher temperatures than standard products with the same glass fiber content. “Its mechanical properties makes the polyamide 6 based Durethan Performance in many cases an alternative material for polyamide 66 compounds, which have become much more expensive in recent years. This substitution can often be carried out without increasing the glass fiber content, so that no higher material density and thus a higher component weight need to be accepted,” explains Linder. Lanxess plans to further expand the Durethan Performance product family. For example, two compounds with 50 and 60 percent glass fiber reinforcement are about to be launched on the market. “With their high strength and rigidity, these materials are particularly suitable for dynamically loaded structural components – for example, in lightweight automotive construction for carriers of electrical and electronic modules,” explains Linder. Lanxess supports customers in the development of cyclically highly stressed components from the concept phase through component and tool design to the start of production. These services are bundled under the name HiAnt. For example, numerous component tests are offered. “In addition to our servo-hydraulic tensile testing machines for the determination of Wöhler curves we have at our disposal a shaker testing facility, which is primarily designed for testing vibrations for vehicle applications, and covers all common vibration and shock tests,” says Linder. Lanxess also carries out pressure threshold tests on components from the vehicle cooling circuit and pressure change and backfire tests on intake modules, for example.